I have troubles when printing circles on my CoreXY 3d printer. 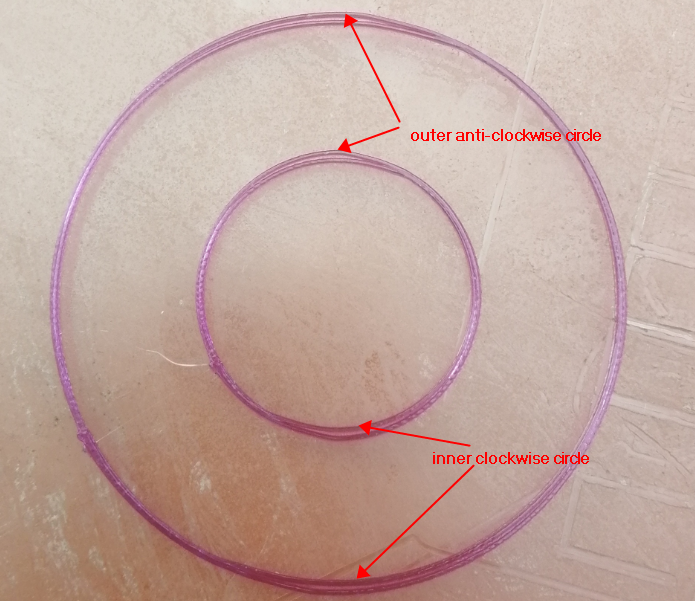 I designed some concentric circles with 0.8mm wall thickness, so a circle can only have a inner skin and a outer skin. then the inner skin is clockwised printed. The result clearly shows that the outer skin (the anti clockwise movement) is off track, while the inner skin is somehow normal. I have tested many times of this cirles, the printing speed, the printing locations, belt tension, pulley, gantry stiffness, different models, etc, none have improvement. Does there anybody have any experience of this? Any suggestions is appriciate, thx in advance. I tried the solutions the thread gave, but still didn't solve the problem that the outer skin out of the track. It is odd to me that the inner skin is normal, while when refers to the outer skin it changes its track at the specific locations. The difference is the inner skin is clockwise movement and the outer skin is anti-clockwise movement. So I guess the problem exists where anti-clockwise movement happens. what tests shall I do? If you release the belts and move the X/Y by hand, does it bind or not feel smooth I wonder ? and do all the pulleys rotate smoothly without binding when turned with the belts released ? do those flat spots correspond to points where belts change direction of movement? How fast are you printing it? Try wiggling the hot-end- any movement? yes, the flaw happens when the belts change direction. but, the pulley hold the motor's shaft well and the idle pulleys have no gaps with their own shaft. And also, belts have been tensioned again and again. Edited 1 time(s). Last edit at 03/06/2019 07:10PM by keyanzhao. Hi thedigitaldentist, speed does not effect to this condition, no matter how slow or fast, the gap between the inner and the outer remains the same. the hotend part is rigid, unless with a big force, can't twigle a little. Edited 1 time(s). Last edit at 03/06/2019 07:22PM by keyanzhao. The fact that it changes with direction of motion suggests backlash in the mechanism. That can come from pulley or motor mounts that flex, drive pulleys that are not solidly attached to the motor shafts, etc. Are you using Hiwin linear guides, or knockoffs from ebay or aliexpress? 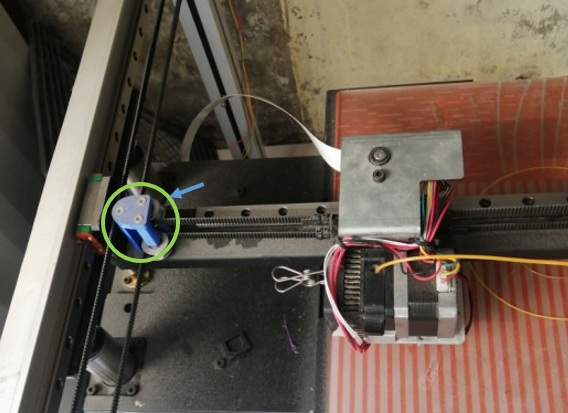 Post some pictures of the printer, especially showing the belt paths of the XY stage. Edited 1 time(s). Last edit at 03/06/2019 08:41PM by the_digital_dentist. sounds reasonable, at start, I was considering these elements might afect. while after several fixings, none did good. how to explain the inner circle? it seems normal due to the outer one. As I can see, there still has direction changement when printing inner circle. the difference is all inner circle is printing clockwisely. so when moving in clockwise direction, circle is a circle, while in anti-clockwise direction, the circle out of track at specific spots. this is my own observe, which may cause some misleadings. any suggestions is highly appreciate. The hiwin linear guides are all new. Edited 1 time(s). Last edit at 03/06/2019 08:33PM by keyanzhao. Everything always looks beautiful and works perfectly in computer renderings.. but they are not your printer. Post photos of the printer. Are they Hiwin linear guides, or knockoffs? Hiwin makes quality stuff, the cheap knockoffs that copy their part numbering scheme are usually not so good. In my experience, slicers print all perimeters in the same direction, either clockwise or counterclockwise. How did you get it to reverse directions? What does the rest of the object look like? I use Cura slicer, the path indeed act like inner skin clockwise and outer skin counterclockwise. the gcode file is uploaded. Your problem most likely lies with the idlers on your X-Axis, the higher of the two pulleys. The plastic mount doesn't look sturdy enough to prevent flex under force/tension, and since you have variations in force being applied while changing belt direction that is what causes your flat spots. I experienced a similar issue when I first built my custom Core-XY. If you have a relatively high degree of tension on your belts you may be able to reduce the prominence of the flat spots by decreasing belt tension and print speeds. However, I would look to implement a stiffer pulley mount, either beefier plastic or something made of metal. I've attached a marked copy of your photo for reference. Edited 1 time(s). Last edit at 03/07/2019 02:07PM by obelisk79. Doesn't all that dirt/dust get into your linear rails and filament path ways etc ? It's a shame to expose an already poorly printer to such an environment. I was just about to say something along the lines of I hope that the dust isn't jamming up your linear guides. I'd still take the belts off completely and make sure it moves freely. I'm also curious about your filament path/spool. In the last picture it looks like your filament is being pulled fairly taught. Maybe something is binding up there and pulling back on the extruder? it was the one I made years ago, I made a new one recently, which is bigger. the new one uses all new parts. I found the condition on the new corexy machine, so I tested the same circle on the previous machine, flaws still there but not so obvious. thanks you guys, i'll give my printer a good environment the next step. Looks like your X belts are not parallel to X rail. yes. there is a tiny angle between x belt and x trail, i'll do some adjustments to make them parallel. however, the result seems on improvement. here is the photo that I print a circle on the leftside of the bed, the deformation is obviously. while, when printing the same circle at the same condition on the right side of the bed, the result seems somehow positive, although there still not so good. Address the issue with your flexing pulley mounts. All the pulleys are firmly fixed with their axles which cannot move with hands wiggling or printing direction changement. I can for sure that pulleys are not the issue.